Our small suburban garden is brim full of edible plants, both native and exotic. About 170 at the most recent count in fact. I’m one of those who’ll only grow a plant if it has an edible or useful aspect to it. After growing Warrigal Greens for the first time a many years ago, I no longer have to buy and sow the seed. It happily self seeds over the garden. I just curtail its wanderings to a different section of the vegie patch each year. This year it has flourished, and there’s lots to use. We’ve had pate, dips, spinach pies, green smoothies and even soufflés. 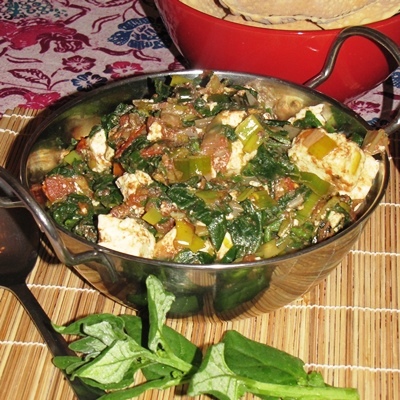 Here is one of our favourite easy recipes for a vegetarian dish using Warrigal Greens, to accompany curries. Roughly chop the blanched Warrigal Greens with kitchen snips. Place a deep sided frypan over low heat. Dry roast the cumin, coriander and fenugreek, stirring continually, til the fragrance rises to meet you. Add the olive oil and mix through and turn the heat to medium. Now add the onion, ginger, tomato and cook til the tomato loses its shape (about 4-5 minutes). Add the spinach, garam masala and garlic to the spice and tomato mix, cooking until the liquid in the pan has reduced. Finally, gently fold in the paneer cheese and turn the heat to low. Mix it through allowing it to soak up the spicy flavour for 5 minutes over the low heat, stirring occasionally to stop it sticking and to coat the cheese. Add salt and pepper then serve hot with curry and rice.